TPS offers a 4-Way Adjustable Clamp Frame System for use in Cut Sheet Thermoformers. Our frames are constructed with steel cylinders and aluminum extrusions, and are adjustable from 6” on up to your maximum frame size. A simple turn of a handle allows the operator to unlock the clamping bars and slide them into position around the mold. Pull a pin and the short bars flip up, disconnect the quick connect air lines, turn the handle, and slide the short sections into position. Changing your clamp frames has never been quicker or easier. 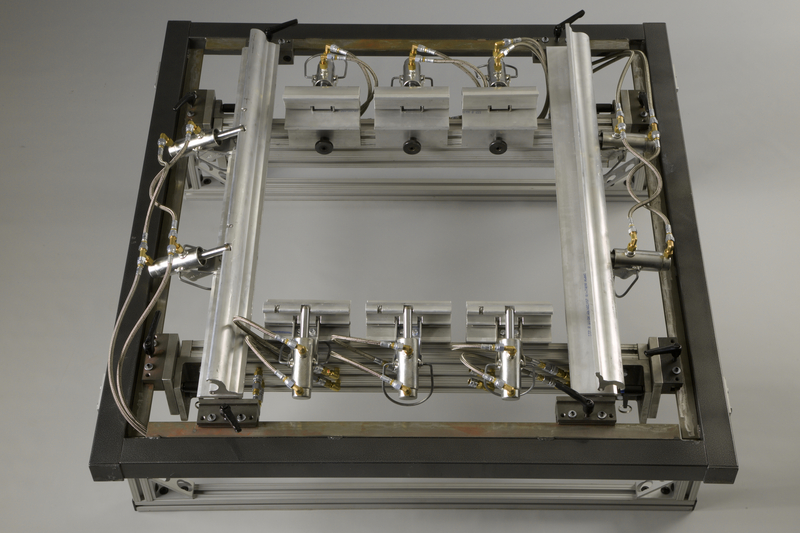 The 2010 Quick Change system utilizes TPS’ original heavy duty aluminum clamp frame extrusions connected to a readily available 8020 profile system providing a clean look and an air manifold for supplying air to the long frames. Section slide back and forth with a hardened steel T bracket on steel angle. The long bar air manifolds creates a low profile system without extra-long air lines flopping around and potentially destroying your heaters. The connection of the short bars to the top of the long bars makes for an extremely easy changeover for bottom loading machines. So why not take a large step toward Lean Manufacturing without redlining your budget. Call TPS today and be sure to ask for 2010 Quick Change style clamp frames for your new or existing machine. TUBE TEFLON HEAVY WALL 1/4"